Well now, 3rd January 2018 already…! I hope yours has gotten off to a rollicking good start and that this year brings plenty of upside to the inevitable occasional lows. 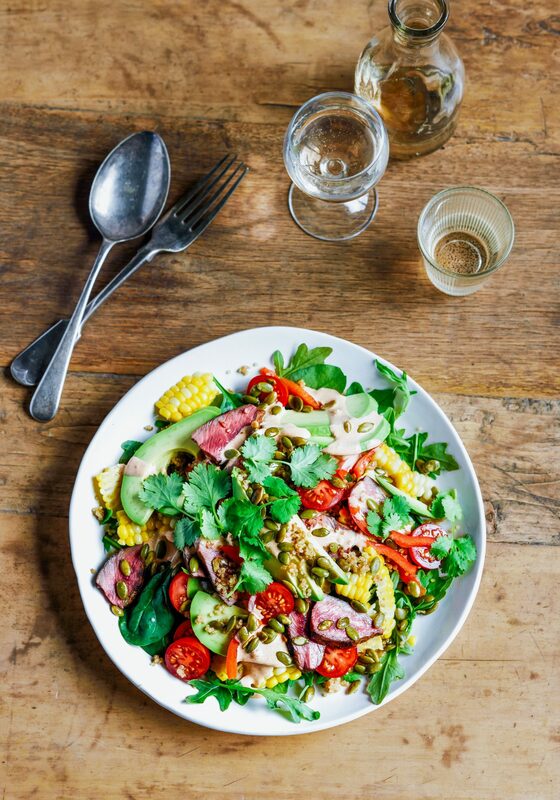 This salad is designed to enjoy while you’re on summer holiday, ideally with loved ones, enjoying the beach and sea – a combination of vibrant flavours and textures with an earthy outdoor vibe. 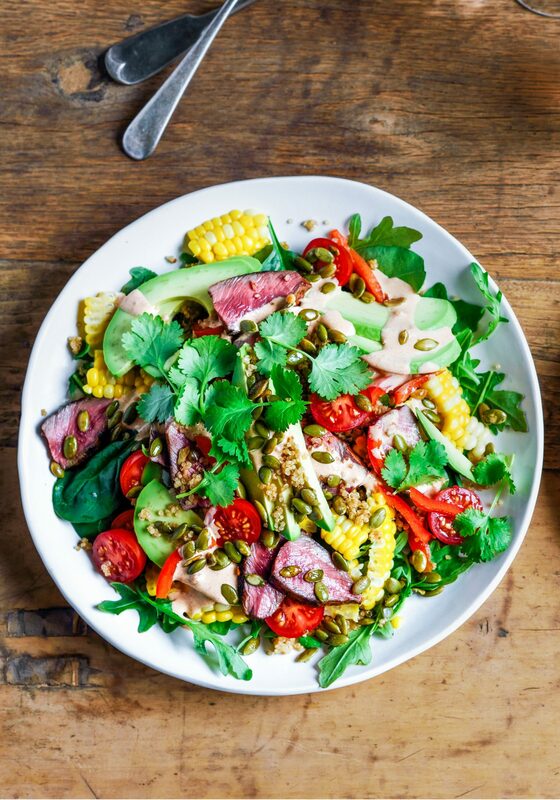 Sweet corn, creamy avocado and red pepper are tossed with quinoa (or brown rice, small pasta or couscous would also work well), peppery rocket, pungent coriander and juicy ripe tomatoes, then topped with spicy sriracha brushed steak and a zesty lime dressing. It makes a bloody brilliant lunch or dinner, and if you serve the steak on the side instead of in the salad, is a great barbecue dish. Right then, my new year has gotten off to a glacially-paced start as I have been mooching around home solo – not by design I promise. I saw in 2018 with some of my dearest friends, but since seem to have slid into a very quiet black hole. Thank God I am finally heading away (sans dogs) next week to have some beach-time with friends so that I can spend some time out of my own head (the curse of the single free-lancer). Pog has been partying up in Sydney with gorgeous Will and Hoob has been cycling around Martinborough on a wine tour with his lovely lady…haha time for their mother to have some fun too…bring on that bloody sand and sea!!! Mix 2 tablespoons of the olive oil with the hot sauce and brush all over the steaks. Leave to sit for 20 minutes. While the steaks are resting whisk all of the dressing ingredients together with 1 tablespoon of water. Cook the steaks in a hot pan for 3 minutes each side (or longer if you are using thicker steaks), then leave to rest. Cook the corn in boiling water for 5 minutes, drain and leave to cool, then slice the kernels off in strips. While the corn is cooling fry the pumpkin seeds with ½ teaspoon of olive oil until golden. When you are ready to serve, angle slice the steaks across the grain into 1cm thick strips. Layer the rocket and quinoa onto a serving plate with the steak, corn, avocado, red pepper and tomatoes. Season with salt and pepper, drizzle over dressing and garnish with coriander and toasted pumpkin seeds to serve.